If you or a loved one is fighting leukemia, it is important to consider launching a fundraising for treatment campaign. Although you could hold this event locally, you can easily increase the total number of donations for medical bills that you receive by turning to a donation website. For example, DonationTo has an easy to use platform that has helped thousands of people worldwide with their crowdfunding for leukemia efforts. Additionally, we have taken steps to ensure that our page does not require any specific technical skills. One of the most important aspects of collecting donations for fighting leukemia is to make sure that you are able to maximize each contribution that you receive. Therefore, we will enable you to avoid paying for any additional credit card fees, and you will also have the option to keep 100 percent of the money that you raise. This is the best way to ensure that you will hit your goal, and it is also one of the many features that helps us stand apart from our competitors. Natalie Grace is a four-year-old leukemia patient who has been dealing with this illness since August 16, 2012. Fortunately, Natalie’s doctors expect her to be completely cancer free in November 2014. Natalie and her family feel very lucky that she has been so successful in fighting leukemia. However, they also fully understand that there are thousands of children who are currently going through the same struggle. Therefore, they made the decision to host a crowdfunding for leukemia campaign to raise money for pediatric cancer research. Natalie’s family first began requesting donations for fighting leukemia via her Facebook page. 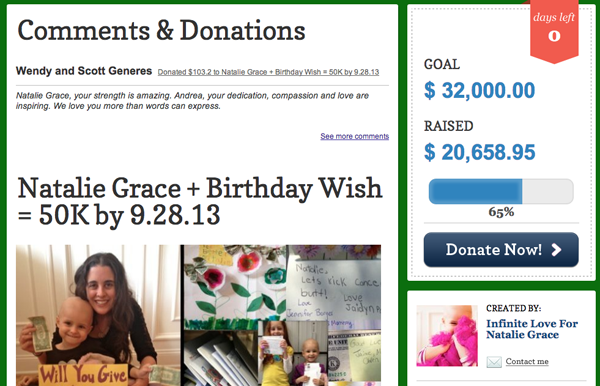 This enabled them to raise $18,000, but left them $32,000 shy of their $50,000 goal. Therefore, they decided to utilize a donation website to help them bridge the gap. In just a few short months, they were able to raise an additional $20,416. Although this means that they still have almost $12,000 to raise, it also means that they were already able to make a donation of more than $38,000 in Natalie’s honor to the “Dream Team” of oncologists that are represented by TheTruth365.org. This year alone, more than 48,000 new cases of leukemia will be diagnosed in the U.S., and 49 percent of these patients will lose their battle with this serious medical condition. However, an early diagnosis will definitely increase each patient’s odds of survival. Therefore, it is important to keep an eye out for some of the most common symptoms of leukemia, including weakness, headaches, night sweats, frequent infections, joint and bone pain, swollen lymph nodes, weight loss and stomach swelling. If you or a loved one have begun exhibiting any combination of these symptoms, it is critical to get to a physician immediately. The type of leukemia that you have will have a major impact on the treatment plan that your doctor prescribes. However, it is common for leukemia to be treated with radiation therapy, chemotherapy, a stem cell transplant, biological therapy and targeted therapy. It is important to note that chemotherapy has not been proven to successfully cure cases of chronic leukemia, but it can be very beneficial for patients with acute leukemia. Natalie’s family launched a Facebook page entitled Infinite Love for Natalie Grace in order to help spread the word about their fundraising for treatment efforts. The page has attracted more than 5,500 followers, and this has given Natalie’s family an additional platform for spreading awareness about leukemia and the importance of raising money for pediatric cancer research. The Facebook page illustrates the entire journey that Natalie Grace has been on since the day that she was diagnosed. However, unlike similar pages, her family ensures that each post remains as positive and upbeat as Natalie Grace herself. Additionally, this page provides some insight into the life that Natalie was living before her diagnosis via photographs and videos. According to TheTruth365.org, cancer has become the leading cause of disease-related fatalities for adolescents and young children in the U.S., and there are approximately 13,500 new cases diagnosed in patients under the age of 18 every year. Additionally, there are more than 40,000 children who need to undergo at least one treatment for cancer every year, and 20 percent of them will pass away from their disease. The American Cancer Society has indicated that the majority of pediatric cancers are a mystery and there is no way to prevent them. However, it is important to note that the occurrence rate of pediatric cancer has shot up by an astounding 29 percent over the past two decades. This is one of the main reasons that it is so critical for people to consider making donations for medical bills, along with providing a contribution to organizations such as TheTruth365.org. Having the opportunity to honor a lost loved one in this way can be very therapeutic, and it can also help encourage other people who have dealt with similar situations. After all, it is important for everyone to know that they are not alone in their grief. Fortunately, Natalie Grace’s fundraiser gave Laura the opportunity to make a difference for other children battling with cancer. Pediatric cancer is one of the leading causes of childhood fatalities in the U.S., and this is one of the many reasons that Natalie Grace’s family decided to launch a crowdfunding campaign. Their daughter is expected to be cancer free by November 2014, but she and her family wanted to do something to make a difference in the lives of other children who will be diagnosed with his condition. Therefore, they decided to harness the power of the Internet to spread the word about their efforts to raise money to support pediatric cancer research. DonationTo is proud to have provided an online fundraising platform that assisted Natalie Grace’s family with the process of raising more than $38,000. We also made it easy for them to maximize each contribution that they received by enabling them to avoid paying for any additional credit card processing fees. Another perk of using our crowdfunding website is the fact that we allow each of our users to keep 100 percent of the money that they raise. As an added bonus, our simplistic platform does not require any specific technical skills, and this means that anyone can create and launch their page within five minutes. Crowdfunding to fight leukemia is possible with DonationTo, a donation website that teaches to crowd fund fast, easily and successfully without any technical skills required.